Hello, my name is Ashly Fernandez and I am an architect by profession. I am from India, my place is called Cochin, "the Queen of the Arabian Sea." If ever you plan to visit India, please do let me know. At the moment, I am in Jeddah, Saudi Arabia. I am working in the construction branch of the renowned company Siemens, of German origin. First of all, thanks to everyone who has already arranged to have such a nice personal Ponton web page with a lot of information about their cars. 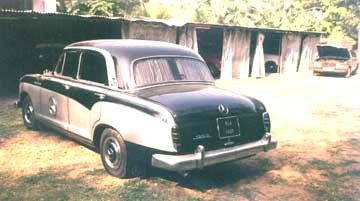 It is really nice to have so many Mercedes-Benz Ponton enthusiasts around the world displaying what vehicles they have. Herewith I am attaching the photos of my 1960 Type 190Db Ponton. You can also see my Type 200 (W110) Fintail, which I bought recently. Both cars are well maintained and in superb condition. I also have a 1955 Type 180 Ponton which is undergoing a full restoration. It takes a lot of time and effort to put these machines back on the road in their original condition, but it is always fun to work on them and to share the matters with similar enthusiasts. 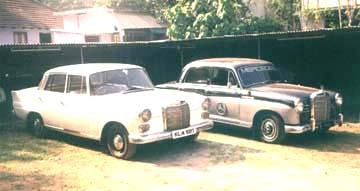 I had a lot of admiration for Mercedes-Benz since I was young. In fact, the provocation for owning a Ponton came after the destruction of our own Type 180D Ponton five years ago. My grandfather was the captain of a ship and he owned a Ponton sedan. It was used exclusively by him until he was unable to drive. He is now in his late 80s and they kept the car out of the parking shelter, leaving it under the sun and rain (heavy monsoons in India) until it was in a condition beyond restoration. I had not seen it for almost seven years and the moment I saw it in that condition, I was almost in tears. Then I took it out to a workshop to start fixing it by hook or by crook. After keeping the car at the workshop, I came here (to Jeddah) and after I went on vacation again the following year, I found the car was dismantled completely and sold as scrap, as instructed by my uncle (my dad's younger brother). I spent several sleepless nights thinking about the car. Since then, I wanted to have a similar car of the same year. I found a similar one, original owner, imported originally to India, with all the original fittings. I did not give it a second thought, and bought it. You can believe or not. I did most of the work myself with the help of an old friend who runs a workshop. I worked on the car disassembling almost everything except the engine, transmission and differential. 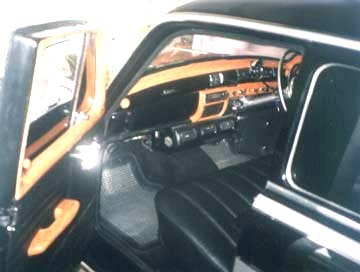 The car was put through a complete restoration process. It was all finished in almost 45 days. Of course, no metal work was needed. The car has got its original metal, because the owner had cared for it like a baby. He was almost in tears when I drove the car out from his garage. Now the car is in peak condition, with all originals put back together. It even has got the original heating switch, etc. I also refurnished the interior, including all of the woodwork. Surprisingly, that year we had a vintage and classic car show. No doubt, my 1960 Type 190Db won the award for the best maintained classic car! I also had some difficulties in finding certain parts like the coil springs, but I eventually found them in an old store. It was really surprising, even for me, how I did all this work. One modification I made to the car was to add an air conditioner. I polished the valve cover, all the diesel fuel pipes, and used galvanized nuts and bolts. When ever I see or come across any spares for this car, I just buy them. So, it was nice to pen a few lines about my Ponton. Anyway, I will only be too happy to answer questions and please consider me as one among you all. This is my contribution to the people who have created such a nice place to gather and to share their Ponton stories and information. Have a nice time and enjoy the Ponton! Until next time, take care and bye.